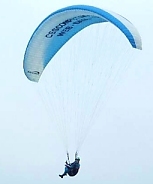 The company is pleased to sponsor Rich to compete in paragliding competitions. In 2002, he came just outside the top 20 of the National League and missed out on second place in the British Paragliding Cup by less than the width of his glider. Over the August Bank Holiday, 2003, Rich's team, Avon Hang-Gliding & Paragliding Club, won the British Paragliding Club Challenge, with Rich also walking away with the Best Individual Pilot award. The Club then retained their title the following year and regained it in 2006. Work commitments have meant that Rich has not been able to spend as much time flying as he would like in recent years but the company continues to sponsor his gliders.